Botillo, cachelos, chorizo, garbanzos y repollo. Gently fry the shallots and garlic in olive oil until transparent. Remove from the heat and let cool. Mix the meat, chorizo, shallots, garlic, raw rice, seasoning and wine. Knead well. Cover and let it marinate overnight. Soak the stomach in water overnight. The following day, wring it out and tie 2 of the 3 openings with string. Fill the stomach with the marinated stuffing. Tie the opening with a string. Hang the stomach from the kitchen rafters or other dry place and leave for one month or more. When ready to eat, soak 1 c chickpeas in water the night before. The next day, fill a large pot with well-salted water. Prick to stomach to prevent it from exploding. Add it to the pot and simmer just below boiling point for 2 ½ hours. When half done, put the chickpeas in a cloth bag, tie it and add them with a small cabbage to the pot. When done place all in an earthenware dish. Have the carver slice the stomach into strips ½” thick. *Today it would be 2 lbs potatoes. So botillo is made with the stomach! I learn something new everyday. To the Anglo-Saxon-New World People: you should not be afraid of trying this aparently terrible things. If you want to have a "medieval" experience easily, this is the short cut, for this kind of things (botillo, chorizos with chickpeas and so) are still typical dishes easy to find. 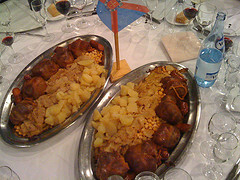 This "cocido maragato" is considered perhaps the richest and heaviest. There is a restaurant in Madrid that offers you the meal (you musn't pay) in case you are able to eat all. Please note there is also a very rich soup, which unlike other cocidos, is served "after" the plate you see in the picture...! First of all, botillo is not cocido. We will get to cocido and "cocido maragato" without fail! The Scots have their version of botillo which is haggis, a kind of savoury pudding containing sheep's 'pluck' (heart, liver and lungs), minced with onion, oatmeal, suet, spices, and salt, mixed with stock, and traditionally encased in the animal's stomach. 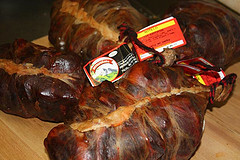 Haggis sold commercially is now encased in a sort of net bag, if I remember correctly. When Marks & Spenser had a store in Madrid, I used to buy it once a month. The whole family loves it.